The Indigenous Shipibo community of Santa Clara de Uchunya, in the Ucayali region of the Peruvian Amazon, is facing invasion of its ancestral lands by corporate oil palm plantations and land traffickers. The community claims as its ancestral territory the entire area traditionally used for hunting, fishing, farming and fruit collection. Yet they have only secured title to a small part, while land traffickers circumvent the law to accumulate titled plots in that area to sell to companies, which then raze the forests for large-scale monoculture. In 2008, the subnational government of Peru’s Ucayali region issued individual land titles to settlers for parcels within the forest claimed as collective territory of the indigenous Shipibo community of Santa Clara de Uchunya. The title holders did not actually live in the area or use the land but belonged to an association of land settlers. In 2012, the association members sold all their titled lands – approximately 5000 hectares – to the company Plantaciones de Pucallpa. Soon thereafter, the company started large-scale forest clearing, which triggered a conflict with the Indigenous community. The community affirms that no less than 20,000 hectares are their ancestral territory – including the surface that was recently deforested – and says the company failed to obtain their free, prior and informed consent before it started cutting trees. In response to the community’s complaint, the Roundtable on Sustainable Palm Oil (RSPO) conducted a formal evaluation. 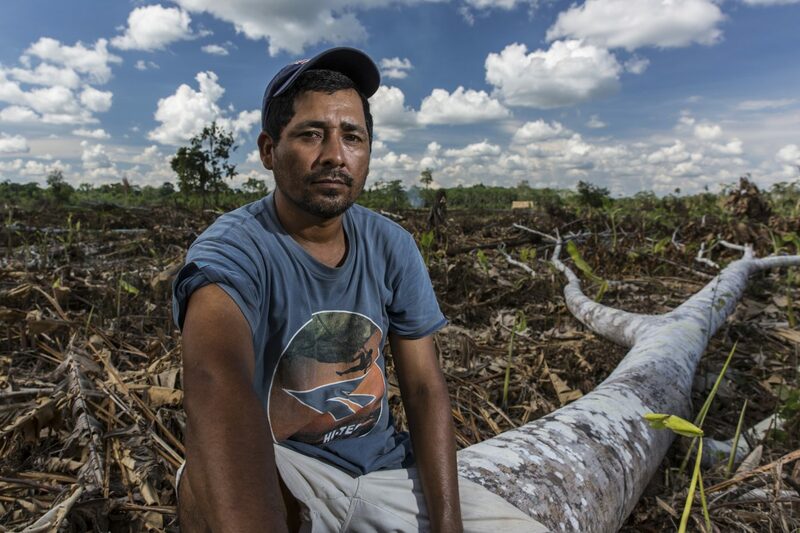 While Plantaciones de Pucallpa withdrew its membership from RSPO on October 12, 2016, stating it had divested from all of its oil palm estates, its operations on the ground simply continued under a new name: Ochosur P. Meanwhile, land traffickers continue to invade collective lands, as newly arrived settlers received titles from the subnational government of Ucayali. The community is taking action to claim rights to all its territory, going to court to revert all titles issued to third parties in that area and demanding the land be returned to Santa Clara de Uchunya, while also requesting the subnational government to title and secure their entire ancestral territory. The case of the Indigenous community of Santa Clara de Uchunya has become an emblematic case of what is occurring in Peru and in the entire Amazon region across Latin America. Large-scale agriculture projects – deeply connected to international food and energy markets – are cutting primary forests and grabbing land traditionally occupied by local peoples. Deforestation and enclosure of communal lands appears to be an unstoppable phenomenon. During the past decade, the Peruvian government has issued land titles to both settlers and Indigenous communities, but at a slow pace due to the high cost of all the steps required by the titling procedure. Indigenous Peoples’ leaders have been vocal about the difficulties posed to obtain collective titles compared to the ease with which settlers and agribusiness companies have been able to acquire individual titles. The regional government of Ucayali should grant collective title to the full ancestral domain of the Indigenous Community Santa Clara de Uchunya. The regional government should ensure protection for the lives of local Indigenous leaders facing harassment and violence from settlers and land traffickers. The Government of Peru should recognize and protect the rights of local communities, especially in those cases in which ancestral territories are being threatened by agribusiness and land trafficking. Palm oil traders should not source from companies involved in cases of deforestation and land dispossession, such as Ochosur. Land Rights Now participants: Federacion de Comunidades Nativas del Ucayali y Afluentes (FECONAU) and Oxfam.